This week I launched the Kickstarter for my comic book Like Father, Like Daughter #4. After two successful Kickstarters, and with the opportunity to self-fund issue 3, Short Fuse Media and I are ready to share more adventures from Like Father, Like Daughter. A little summary on the book: Casey Ryder is your seemingly average high schooler, except for the fact that her father left her to become a full time superhero. Everyone in the world loves Invulnerable, but Casey knows her father’s true colors. In the first issue it’s revealed that Casey has inherited her father’s abilities. The rest of the series explores what Casey will do with the very powers that made her father leave her family. Like Father, Like Daughter #4 picks up where the third issue left off. Casey has finally come face-to-face with her father after ten years of abandonment, and as we promised there’s a big twist at the end of the issue that you don’t want to miss! This will change the story of Like Father, Like Daughter forever! The Kickstarter has a lot of great tiers if you support the book including the comic itself, prints, cameos, and action figures. The Like Father, Like Daughter #4 project is also taking part in Kickstarter’s Make 100 campaign with our $45 dollar tier where we are trying to make 100 backers for that single tier. If you support this category you will receive a Like Father, Like Daughter #4 Make 100 variant cover signed by myself, a second additional companion comic titled “Day Off”, an exclusive #IndieHeroinesMatter pin up, an “Advice” pin up, and the biggest gift a copy of the first issue of a new title in the “Comic Unoverse” called “They Call Her…The Dancer”. 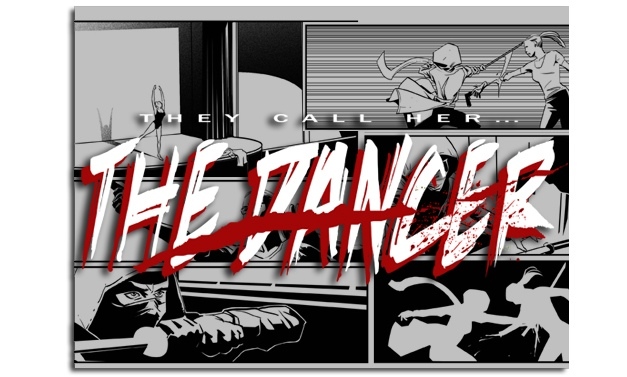 A gritty and psychologically driven assassin story that focuses on the art of dance and martial arts. We hope that you can support our comic book campaign! You can check out the Kickstarter here!